Data use, openness and collaboration are the pillars sustaining a growing open contracting community that is driving meaningful reform and improving people’s lives. 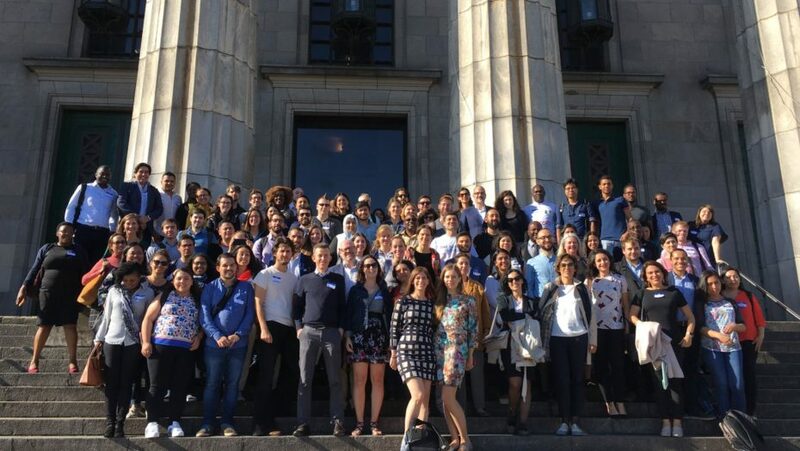 Last week in Buenos Aires, we celebrated impressive progress in our growing field. More than 20 government agencies are now publishing open contracting data with another 20 working on its implementation. We can report on concrete and tangible impacts that open contracting is having on people’s lives in Colombia, Paraguay, and Ukraine. Stories are also emerging from others places around the world how open contracting has been used to expose corruption, increase competition and transform contracting into a digital service for citizens. Dozens of tools are beginning to make procurement data easier to use to monitor performance and outcomes. We did not celebrate for long, however. There is no room for complacency. Our field facing real challenges: vested interests, poor articulation of problems, tick-box disclosures, low capacity, a lack of budget, poor data infrastructure, poor data quality, low capacity to use data and profound inertia to overcome to ensure that open contracting reforms scale and have systemic, sustainable impact. When a reform effort lacks a vision beyond compliance, or isn’t pushed through, open contracting runs the risk of open washing, as Fernanda Hopenhaym of PODER pointed out. Jeni Tennison, CEO of ODI, cautioned us to set higher rather than lower expectations of partners to shift the definition of ‘business as usual’ to a wider vision of open to get to impact: open for innovation (i.e. to new ways of doing things), open to collaboration, open data and open, reusable tools and, lastly, open to learning and measuring impact. Juan Pane from ILDA noted that we can’t ignore the political economy contexts in which these reforms are happening, where powerful vested interests exist, and the need to adapt approaches under these circumstances. Transparency (and implementing the OCDS) is only the means to an end to break open public procurement; the end is systemic change to deliver goods and services. We were inspired by people like David Riveros Garcia who heads ReAccion, an NGO emerging from a grassroots movement to track government spending in the schools of Paraguay’s second largest city. He said: “We are not data scientists but we work with open data. We wanted the students to own the data and ask the municipalities what happened.” The impact has been tangible. Now, 10 schools in eligible communities have been benefitting from the funds up from two before their engagement using open contracting data. Our partners from the Fiscal Observatory in Chile, Poder in Mexico and the Sinar Project in Malaysia have all been working to connect information on contracts with vested interests and shared their insights over the course of the week. With a more diverse set of users engaging with open contracting, we may need to explore quick and easy entry points to analyzing open contracting data. This was evident in the interest in solving specific, problem-driven questions during our Abrelab session at Abrelatam – such as access and cost of medicines, school infrastructure, or linkages to the “original sin” of campaign finance – as one of the leading Argentinian journalist covering the notebook scandal coined it. Eliza Niewiadomska from the EBRD is working to reform procurement institutions and systems in more than a dozen countries. She said that public procurement reform works best when open data and open source is embedded into the digital tools & services. “We have seen zero damage done by transparency but a lot of damage by preferential treatment of supplying companies. If the government is brave enough to bring change, this is what I do”, she added during the panel. Lastly, many people in our field and at IODC are reflecting on the wider way that data culture is developing, especially around artificial intelligence, machine learning or blockchain. With the understanding of the value and opportunities comes a clear sense that the ethics of data is as important as its openness. This desire for openness, transparency of how data is being processed, as well as for privacy flows essentially from the people’s wish to exercise agency in ways that they choose, as Omidyar Network’s Laura Bacon pointed out. We discussed how important it is to make sure our spaces and projects reflect the same values we wish our data sets to espouse: just, equitable, and inclusive. The gender panel at IODC raised the importance of threading gender into the work of not just open contracting but also the wider open data space. As we develop our new strategy, we will be tackling these issues head-on. So, the open data hype is gone. Long live open data. Open contracting will certainly lead the charge focusing on delivering impact as we look forward to our next IODC reunion in Nairobi in 2020 where we will have even more insights and lessons to share from the frontline of systemic change driven by data. Also, a quick thank to our amazing partners: ILDA (who are now officially an independent organization), Hivos Latin America, and the conference organizers of the Ministry of Modernization led by Rudi, Gonzalo, and their team! It was an incredible experience that our community benefited from immensely.